Israel is "sitting on 200 nuclear warheads" and is "crying wolf" about Iran's nukes, charges IAEA envoy. Iran’s envoy to the International Atomic Energy Agency (IAEA) slammed Israel on Friday, accusing the Jewish state of attacking its neighbors and committing atrocities. "Israel, sitting on 200 nuclear warheads all of them targeted at Muslim cities ... is crying wolf about nuclear proliferation,” the envoy, Reza Najafi, told the UN nuclear agency. “This regime (has) a long history of aggression against neighbors, atrocity against peoples under occupation and clandestine development of all kinds of” weapons of mass destruction, he declared in the comments quoted by The Associated Press (AP). Najafi also told the agency that Iran's six-month freeze of its nuclear program, agreed with world powers in Geneva last weekend, will start by early January. "We expect that either at the end of December or the beginning of January we should start implementing the measures agreed by both sides," Najafi said, according to AFP. 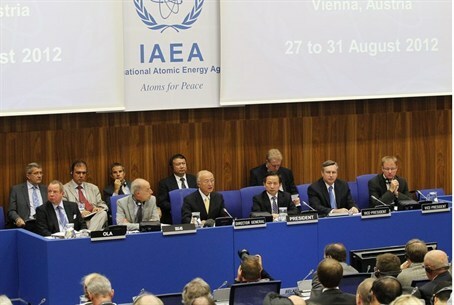 The accord struck foresees Tehran rolling back some of its nuclear program temporarily in exchange for sanctions relief. The freeze is meant to make it more difficult for Iran to develop a nuclear weapon and to build confidence while Tehran and the West hammer out a long-term accord. It has been unclear since Geneva when the accord was due to take effect, with technical discussions between Iran, the powers and the IAEA, whose job verifying Tehran's compliance will be key, set to work out the details. A spokesman for EU foreign policy chief Catherine Ashton said Wednesday that the start date has not yet been set. "We have had preliminary discussions with the agency with regard to the nuclear-related measures ... to be verified by the agency," Najafi said Friday. "We are going to continue those discussions." On Sunday, Prime Minister Binyamin Netanyahu received a phone call from U.S. President Barack Obama to discuss the deal. During that conversation, the two reportedly agreed that Israeli and American teams would hold consultations on the permanent agreement. It has also been announced Israel and the United States plan to hold a joint military drill in six months, just as the interim agreement between Iran and the West is due to expire. “The wind from the Americans into the Israeli sails is, ‘We will maintain our capability to strike in Iran, and one of the ways we show it is to train.’ It will send signals both to Israel and to the Iranians that we are maintaining our capabilities in the military option. The atmosphere is we have to do it big time, we have to do a big show of capabilities and connections,” an Israeli official told TIME magazine.